Mr. C's car wash in downtown Detroit has a problem. When employees put a car equipped with a door keypad on the conveyor, the brushes are registered as button presses. 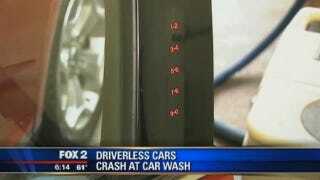 After a few invalid codes, the doors lock up, and a driverless car is rolling out of the wash. Yes, the law of unintended consequences is alive and well. This comically overwrought report by Fox News in Detroit shows video footage of a Ford Focus rolling off the wash line as employees scatter to stop it before it crashes. And according to Mr. C's general manager, Rodney Watts, it's something they've encountered six times so far this year. "When the car goes through the wash, between the cloth, the high pressure vents, the dryer sets off the keyless entry," says Watts. Other washes in Detroit have reported similar issues, and Mr. C's sent a letter to Autoweek to draw attention to the issue. Apparently Dutch has gotten back to them. Fox got a statement from Ford, which said, "If the wrong code is entered seven times, the keypad goes into an anti-scan mode disabling it for one minute." GM and Chrysler haven't responded so far. Considering most automakers that offer external keypads have moved to capacitive buttons, it's curious why we haven't heard about this more. Then again, many car washes have a human in the car to begin with.